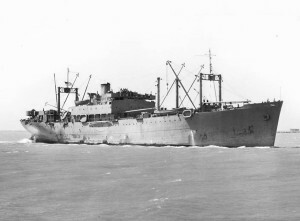 Dimensions 417'9" by 60' by 27'6"
The Otus was completed in 1941 as a Maritime Commission standard C1-B cargo ship converted to a destroyer tender. It was at Mariveles when war broke out. Though slightly damaged in the Cavite raid, she escaped the Philippines debacle and survived the war.